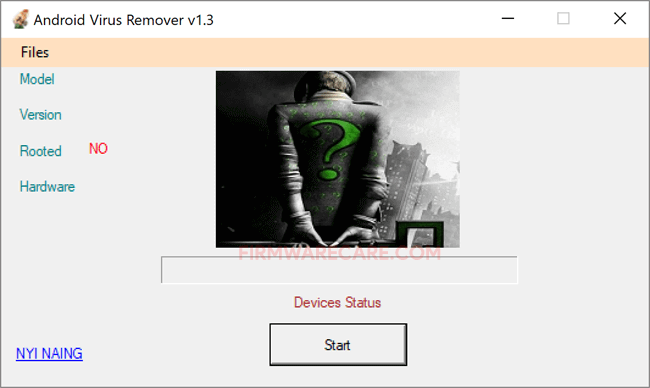 Android Virus Remover V1.3 is a small application for windows computer created by Nyi Naing, which allows you to remove the Virus from Almost every Android Smartphone and Tablets in the world. It also allows you to check the complete information of the connected Android Device including the Model number of the device, Android Version, Root Status, and Hardware Type (chipset). In order to use it, you need to install the ADB Driver on your Computer. Once Driver is installed, Connect your Android Device to the Computer using the USB Cable and Click on the Start button to begin the scanning process. [*] Compatibility: The Android Virus Remover V1.3 runs perfectly on Windows XP, Windows Vista, Windows 7, Windows 8, Windows 8.1 and Windows 10 (32 bit and 64 bit). [*] Credits: Android Virus Remover V1.3 is created and distributed by Nyi Naing (developer). So, full credits goes to Nyi Naing (developer) for sharing the tool for free.